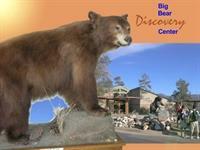 The Big Bear Discovery Center is Located on the North shore with spectacular views of the Lake & local Ski Resorts. 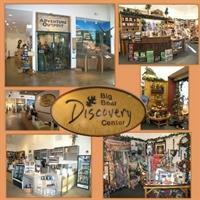 The Discovery Center is your source for information about Big Bear campgrounds and recreating in the Big Bear Valley. 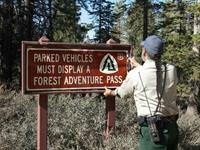 Let their dedicated volunteers & experts help plan your outdoor adventures. Big Bear Valley has some of the most picturesque hiking trails in Southern California. The Discovery Center has lots of informational maps about the area. They can provide you with free maps and information about the paved Alpine Pedal Path, Interpretive Hikes, the Pacific Crest Trail, and more strenuous routes for experienced hikers. At the Discovery Center you can purchase your Adventure Pass, if you travel into the forest, your parked vehicle must display a Forest Adventure Pass - a 1 day pass is $5 and a season pass is $35. At the Discovery Center you and the family can take a Guided Nature Tour / learn how to track animals / join a Discovery Center Naturalist for a bird walk / take a wildflower tour or obtain permits for camping, campfires, & wilderness area trips. 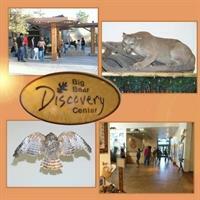 The Discovery Center has events all through the summer. Visitors to the Center can enjoy the constantly changing exhibits on wildlife and browse through The Adventure Outpost gift shop & bookstore -revenues support this non-profit Center. The programs are brought to you through a partnership of the San Bernardino Nat. Forest Association and The San Bernardino Nat. Forest. For pictures of the Big Bear Lake campgrounds and Hiking trails go to the Activities Guide at the top left menu of this website.